I met Kathleen at the art galleries when we were looking at the big plates arranged to look like a ‘T’. 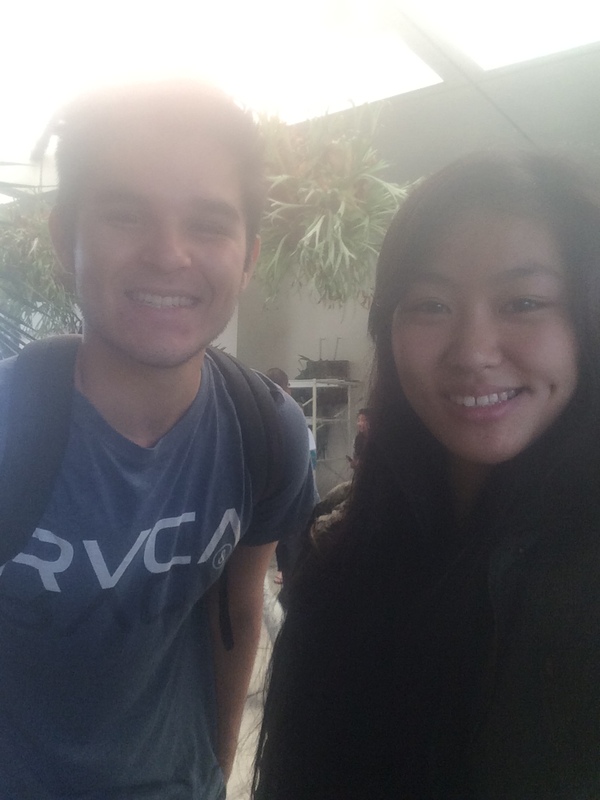 She is a freshman who is attempting to pursue a major in Health Care Administration at Cal State Long Beach. Kathleen is dorming at Hillside and is from the Bay area in Northern California. I talked to her about the art class and what she thought about it, and she stated that she’s not really artistic but the class is pretty easy and she has enjoyed the various activities we have done in the class. When we were talking about our hobbies, she told me that she is in the water polo club at CSULB and has played since she was 14 years old. She has been competitively swimming since she was just 6 years old. Right now Kathleen is taking 15 units for school and has a three day weekend like myself. I asked her why she wanted to pursue a career in Health Care Administration and she replied that although she wants to aid people, she would rather do it indirectly so this job is better for her. 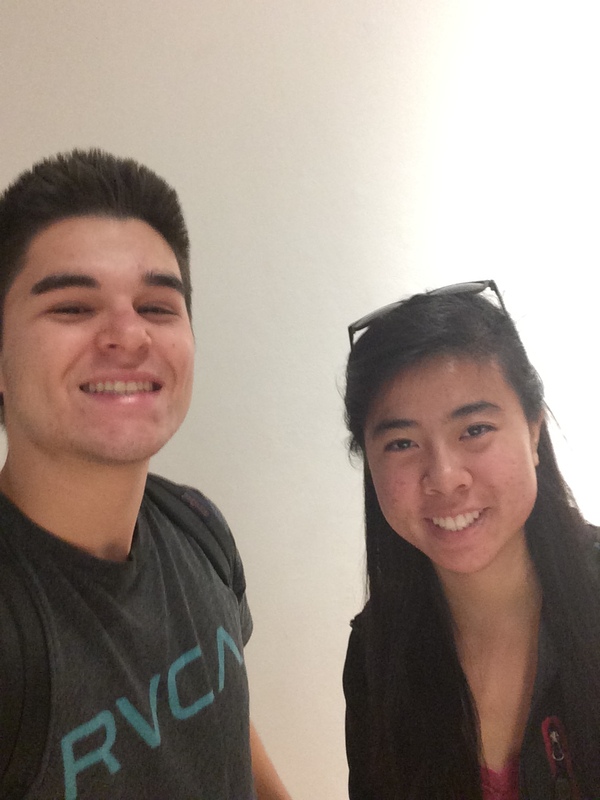 I had a nice conversation with Kathleen and hope I can talk to her more next time in Art 110. I decided to make a picture using pennies commonly known as “Penny Art”. The inspiration came to me when I saw a jar of coins at my girlfriends house and I heard and seen art sculptures and pictures created using coins. I figured I could construct a picture with the coins and make something that I never would have thought of. After looking up pictures of ideas I decided that a ship would look pretty cool. 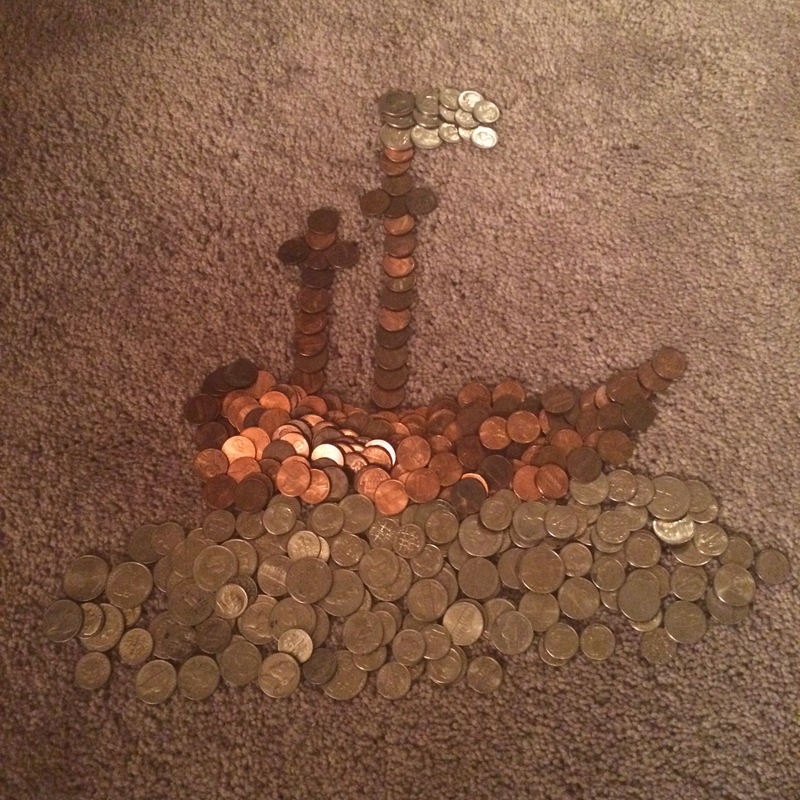 I used the bronze pennies to assemble the ship and finished off the remainder of the picture using the silver coins as the water. Overall, I think the picture came out pretty good and the layers of coins I used to construct the image made the water look like waves and ship with compound structure. I’m glad I got to once again try something new and hope I can continue to do some form of art that I can enjoy and feel proud of in Art 110. I’m excited for next week so I get to show how to do a particular activity. Wesley Hicks art exhibition in the gallery this week was very intriguing yet very confusing at the same time. Initially I walked in and was excited that the art was ceramics because ever since taking ceramics in high school I have enjoyed the art. The colors of the clay and plaster were very vibrant and made the ceramic art pop out. The reason why Wesleys exhibit confused me is because I couldn’t figure out what the purpose or theme of the art was. 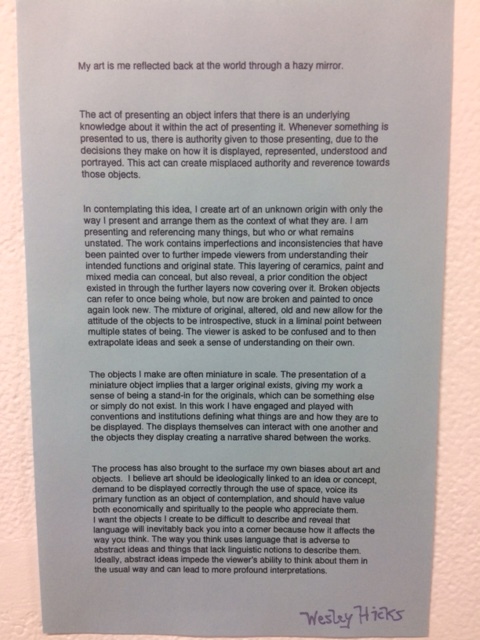 Wesley claims that his art has an underlying purpose and is presented in a way so that the object can be perceived as something that it isn’t. Wesley also states that his art is mirroring himself, which illustrates how art can project ones creativity and individually. The thing I liked about Wesleys art is that he says since he uses art of unknown origin, the way it’s presented and arranged gives the most context of the art. The cracks in the ceramics and imperfections are used to relate to humanity and how we can be deceived by art just because it’s not ideal or perfect. The different ideas of Wesleys art may be confusing but I’m glad that I looked at the gallery and got to ponder on the purpose and ideas that I wanted to understand. For this week’s activity I knew I could have fun with it. When I was informed we had to do a photo depicting our death I thought of a numerous ways I could portray my decease. In the end I figured the most comical way to die would be by the hands of the world’s most loveable snowman, Olaf. 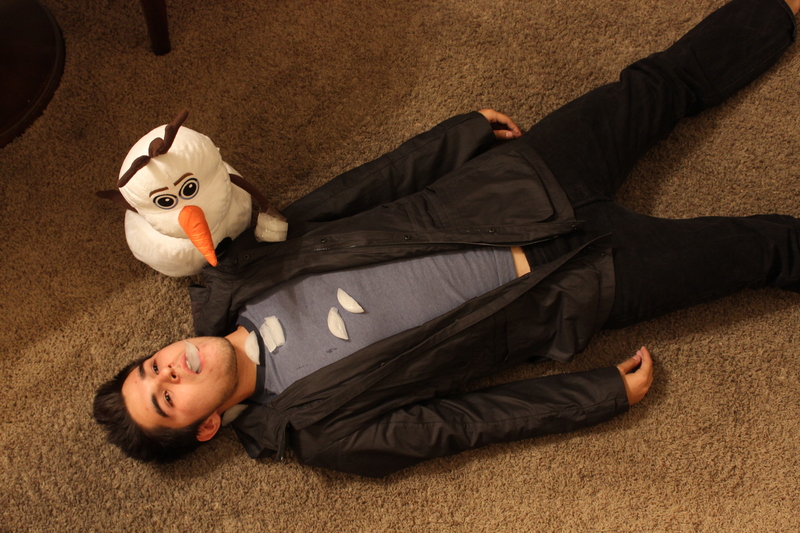 The $15 dollar stuffed creature was put to use so I could create a great death scene where Olaf has suffocated me with his ice. Olaf knows ice is the fastest way to murder someone who is so warm-blooded, so he knew he could take me out with style. This picture shows the fear and despair in my eyes and the frozen tundra that has become my lungs/mouth. Olaf’s face shows no mercy as he takes killing to a new level. Is this the way I want to die? Of course not. “Death by Olaf” is probably the least possible death scenario ever known. So the fact that Olaf decides to slaughter me is showing that I have wronged him so far. I will fear this scene coming to life in my nightmares for ages to come. Dana Fleming’s art exhibits were really interesting and the way she constructed everything really made an impression on me. Fleming commented on h0w objects intrigue her and how they are surrounding us every day and make up everything. Each object has a specific function and can be used with amazing abilities, but when it’s not being used it’s just stagnant and occupying empty space. Her work is using these idle objects and putting them in a practice of objectifying objects. 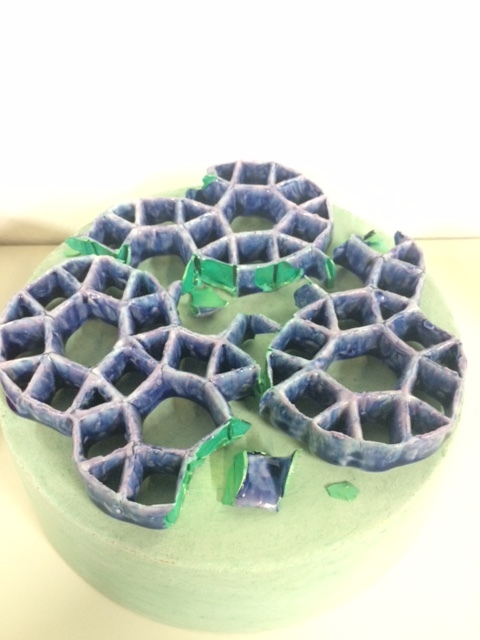 Since the objects used in the exhibit came from a thrift store, they were thrown away items that were put together to create art and show how items that decay to waste can become art. This specific piece is was a small coliseum made out of styrofoam and painted red to lay on a stand. I thought it was incredibly well crafted and utilized to show how art can be created out of seemingly anything, even things that are seen wasteful. 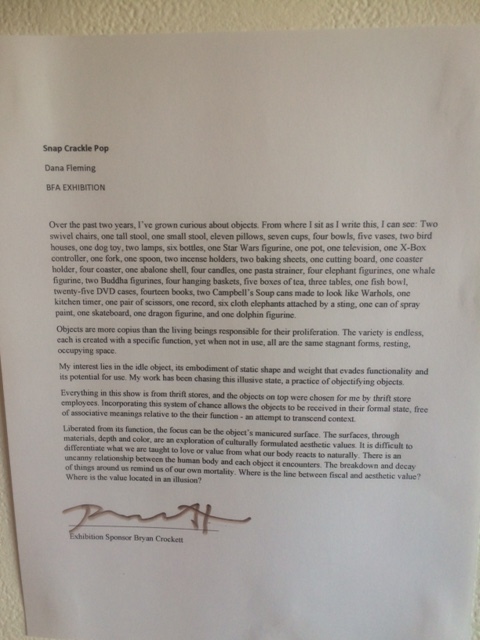 This was my favorite out of Dana’s work but the others were very interesting as well. I’m glad that more people went into the gallery to see Dana’s art because the purpose and creativity behind it is what true art is. Art is when creativity and the use of simple life can create beautiful things. I hope to see more art like this in the galleries because I felt like I can create something from anything that can make others be inspired as well. 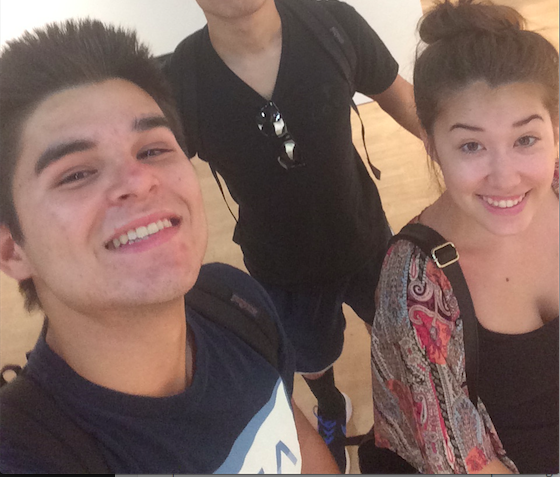 Breanne Lee is a Sophomore at Cal State Long Beach who I met at the art galleries for Art 110. Breanne was nice and I had a good conversation with her. She is currently a fashion major and is taking art to continue her education for her major. She is out of Northern California and is currently living at an apartment not too far away from campus. One thing that was very interesting to me about Breanne is that she interns for a clothing boutique and works two days a week. She commented on how the clothes are more high end and it’s a rather nifty store. This made me curious about an internship that may open future job opportunities for me. Breanne was apart of club cheer and cheered in high school as a flyer. Her creative aspirations for fashion and cheer show that she is a very outgoing and a fun person to be around. I’m glad I got to speak with Breanne and hope I see her around Art 110 more.